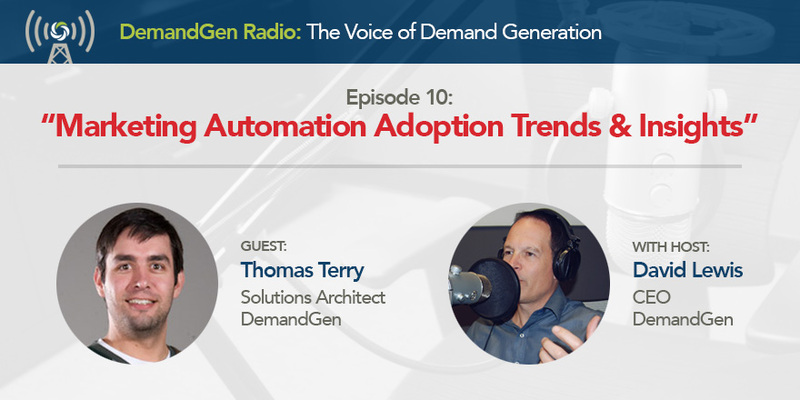 Thomas Terry, one of DemandGen’s Solutions Architects, joins DemandGen Radio host David Lewis to discuss the trends taking place in the adoption of Marketing Automation across DemandGen’s client base. Thomas serves as the lead architect for many of DemandGen’s enterprise and mid-market clients using Marketo and he discusses the growing popularity in connecting Marketing Automation systems to backend databases as well as using systems like Marketo for transactional email programs. David asks Thomas to shed light on the key insights he has gained from working across DemandGen’s client base in the areas of reporting, database management, MarTech assessments, and how Thomas assists clients who want to migrate from one marketing automation system to another. They also discuss new roles and responsibilities that have emerged across the more sophisticated demand generation teams that DemandGen works with.